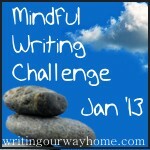 I started writing small stones in the first challenge (in Jan 2011 I thnk) and haven’t stopped. Continue collecting and sharing life! Happy New Year! This is my first year, but I can see it becoming a happy habit 🙂 I love your small stone for today with the “play” off the word winter. I’ll be checking out your site in greater detail ASAP. Thanks for stopping by and Happy New Year to you too! As a guardian of 7 inside cats and 2 porch ones — I LOVE this one!! Thank you for the smile! Great start! !